Emergency Contact - Who would be at the top of your character's list? Character Development – Whose number is at the top of their emergency contact list? 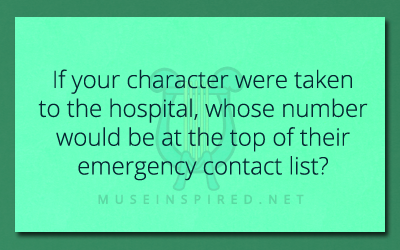 If your character was taken to the hospital, whose number would be at the top of their emergency contact list? You never know when you might have an accident – and that is no different for our characters. Who would be the top of the list for your character? Would it be a parent? Their spouse? Children? Perhaps it’s someone unexpected. They may not even have someone that can be contacted at all. Who they have on their list can give great insight to their relationships with the people in their lives. Character Development - Which of the Seven Virtues best fits your character? Character Development - How does your character react to stumbling over a dead body. Character Development - What is your character's idea of a perfect world?